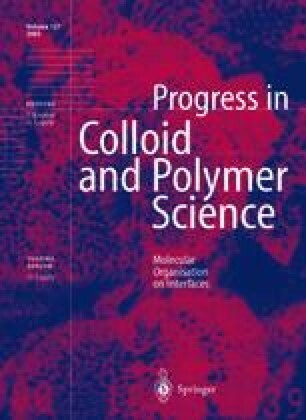 Two new polymer surfactants consisting of a polysiloxane backbone with amphiphilic side chains of the nonionic oligo (ethylene oxide) type have been synthesized. The phase behavior of aqueous solutions of the low-molecular-weight surfactants, from which the side chains are formed, and of the polymer surfactants was characterized by polarizing microscopy and 2H NMR spectroscopy. Both polymers form a lamellar Lα phase over a broad range of concentrations, whereas no liquid-crystalline phases were found for the low-molecular-weight surfactants. The orientation of lamellar solutions of the polymers in steady shear flow was investigated in situ by 2H NMR spectroscopy in cone-and-plate geometry. The NMR results indicate an orientation of the layer normals parallel to the velocity gradient at low shear rates and the formation of multilamellar vesicles (onions) at intermediate shear rates for both polymers. The range of shear rates where NMR spectra characteristic of vesicles are found as well as the state of orientation at high shear rates are different for the two systems.